racefriv.com: Project: Scrap Metal- Update 3!! Project: Scrap Metal- Update 3!! Alright, it's that time again...time for me to show you the money pit we call Project: Scrap Metal. A lot has happened since we last talked, Whitney died, Valentines day, and someone is running for president. But really none of that crap matters (just kidding babe!). All that matters is that drift season is almost upon us and project scrap metal is well... still looking like scrap metal. But it's getting better everyday. Click and read more to check out what RaceFriv has been up to. We will get to the cage in a minute. First things first, I got a hood...overnight parts from Malaysia! It's a legit Silvia hood (I prefer metal to fiberglass, as you can bang metal sorta back into shape). I got it off ebay and it literally got here from Malaysia in two days! It was cheap and it came in pretty good shape for a 20 year old hood. Throughout this post, please forgive the bondo everywhere; once the overfenders come in its going to get painted so I'm preparing for that. For a car that I'm pretty sure has been wrecked three times, everything is fitting up quite nicely. So, I went a bit nuts at Enjuku Racing.....I even went five lug! Four lug and widebody parts were just not going to work out. I played with the Z32 brake upgrade idea for a while, but I had already installed new pads and rotors at all four corners. After researching the swap, I came to the conclusion that it was going to cost me a good bit and I'm still running a sorta stock KA24 so the normal bigger 'vert brakes will suit me just fine untill I find more power. I took my new rotors to a machine shop and they did a great job on drilling the new holes for 5x114. Also went with some ISIS tension rods as my bushings were completely ruined. What you can't see in that picture is the new Tein inner/outer tie rods with spacers, and replaced the steering rack bushings as well. I plan on modifying the rack stop on the LCA to assist in some crazy steering angle. I've got a set of 4 XXR 522, 18x9.5 +25 for the back (probably going to need some spacers) and a couple of MB Battles 17x9.5 +15 for the front. (federal tires in the mail). I went with 18's in the back for the simple fact that I have a bunch of half-done tires off my Subaru, which also has 18 inch wheels. Luckily, I was smart and kept all my old tires, so I've got maybe a years worth! Went with 17's in the front because 18's are just too huge if your going for extreme steering angle and have no fender/wheel well work done for better clearance. Got a used Sabelt seat, still FIA certified and its been raced in by one of the guys from the Flying Lizard team. So it's got good mojo, or something. As keeping with the tradition on making everything I possibly can from scratch, I made this seat bracket. It fits great and its sturdy as hell. Here is kind of a mockup of the driver area. I painted the bracket copper, and picked up a used Personal wheel that is super nice... and this leads us to the cage!! So I promised I'd give this a review when I was done as a lot of people have asked me about it. So this is a Brokedickracing cage, or BDR cage for short. It was $712 shipped, and everything fit up pretty damn well. There aren't a lot of places that offer a cage for the 'vert (it's not like a coupe) but BDR is one of them. It came pre-notched on one end leaving some idea of where it goes and letting you cut and notch the other side yourself. This is a good approach as every cage is different. Everything fit really well and there is plenty of metal left over for doing another door bar and a back x-brace. Im leaving it like this for now as its .120 DOM which is, really thick as far as cages go, and it should be plenty good for the local stuff I'm doing this year as well as stiffening up the 'vert quite a bit. For my first cage it came out pretty well, very happy with the results. Most people are worried when they order pre-fit cages online that the cage will be too small and/or won't fit correctly, which is a legitimate concern. Not for this cage though. That's a 1/4 inch spacer I shoved in there to prove how close this cage is; the latches on the convertible top scrape the top bar when it shuts! It's realisticaly as big as it can get with the top still working. Between the top bar and the vert top there is about 1/2 inch of space, just enough for some padding. For the back brace, I welded the plate straight to the strut tower which should give it some good rigidity. For the coupe and hatch S13 owners out there with that weird look on your face, yes, on the verts they welded in a huge square between the strut tower bars to add rigidity from the factory. No strut tower needed on this baby! In this awful picture is the front plate from the top hoop supports. 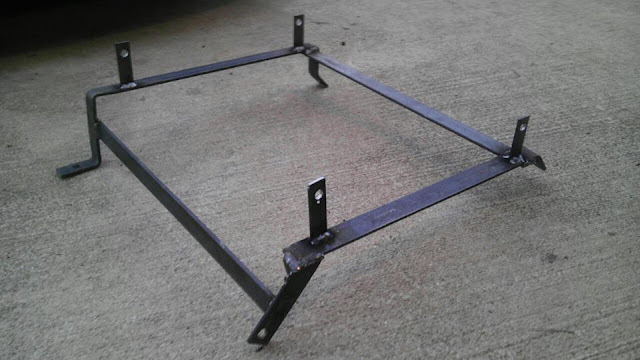 Again welded on two planes which is especially important here where due to the design of the floor its almost imposslbe to weld all the way around it and the floor is made out super thin metal; When I welded this in the underside kept catching on fire! So that's it everyone! We hope everyone else's builds are coming along as well. Stay Friv everyone, can't wait for the season! You can check the past updates here.